There are many different leaf blowers to choose from and each one offers a different design and set of features. When you are looking for the right leaf flower to buy it is important that you take the time to look at each one to see what each of them has to offer before making a final decision. A leaf blower can be a very useful thing to have in the autumn when all the leaves start falling off the trees, but you will need to make a point of choosing one that works as efficiently as possible. You will find that some leaf blowers are better than others at what they are designed to do, and their efficacy depends on a number of factors, including the power of the motor as well as a variety of other things. The more time you take to look for the perfect leaf blower, the better your chances will be of finding one. The Toro 51609 has a lot to offer when it comes to rounding up giant piles of leaves, including a variable speed motor for better control as well as a metal impeller that is able to create a fine mulch. The quick-release latch allows you to turn this leaf blower into a vacuum within a matter of seconds and without any additional tools. The noise level of this leaf blower is also great, as you won’t have to worry about it being really loud like many others on the market. The high-powered, durable design of this leaf blower is what makes it truly great. There are some drawbacks to using the Toro 51609, including the fact that the power receptacle is mounted on a cable tail that is a bit too short, so it tends to disconnect easily, cutting off the power. Strain relief is nonexistent, so it may be necessary to repair the short section of the cord at some point. The motor that this leaf blower uses could be a bit more powerful, and it is a problem that you may notice if you have used powerful leaf blowers in the past. While most of these problems aren’t major, they are worth keeping in mind before making a final purchase. The Toro 51609 is a good leaf blower overall, despite its few minor flaws. This leaf flower is able to do its job without any major issues, making it a solid investment for most people who are looking for an efficient way to get all of the leaves off their lawn. While this leaf blower may have a lightweight design and feel a bit cheap, it is definitely durable and can withstand the test of time. With numerous speed settings and a quiet hum that will surprise most people who have owned other leaf blowers before, this particular model is definitely worth considering. 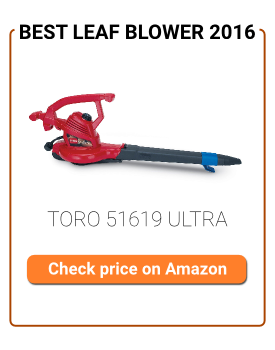 It’s true that this Toro leaf blower may not be the most powerful one on the market, but it is able to efficiently clear a yard full of leaves. The 3-in-1 versatility makes managing various yard work tasks easy and simple, which is definitely something that any homeowner can appreciate.